E-Mail To The Press – Pakistan School Bus Accident! « Being The Safe Driver! Behind The Wheel! Behind The Wheel!, Being The Safe Driver!, Interest of the Nation First!, Letter To The Press!, Look at the bigger picture!, Majid Al Suleimany, Oman School Bus Accidents, Open Letter on RSA, Pakistan School Bus Accident, Think outside the box!, We need to change now - and fast! Reference your headline headings in all your newspapers. I reside in Qorum Heights (PDO) and all morning yesterday we saw from the roof of our villa all the ROP cars and ambulances on the road – sad and tragic really. Only some good senses of some good Samiritans stopped the case even getting more worse from confused and dazed children! 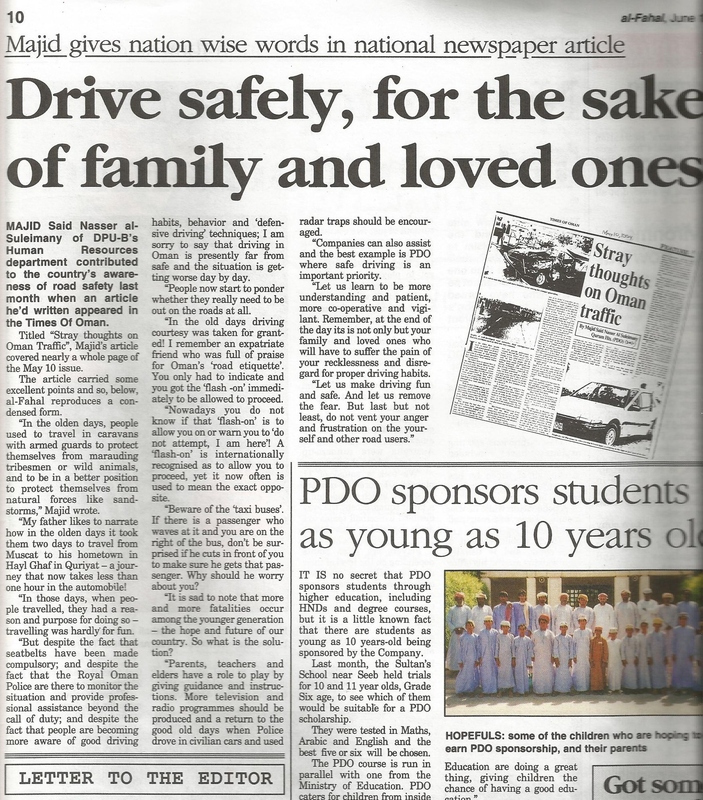 As you are all aware of this undeniable fact – and however you hate me and my guts – and all I stand for in life – one thing undeniable is that I am one of the few Omani and otherwise Columnists that had written quite intensively and detailed on Road Accidents – actually some of my first articles sine March 2003! My books and columns easily verify this! With exception of Muscat Daily (Mohamed Zafar) I had almost to beg some in The Observer to advertise on my above books – and in the end had to use my own columns to write on my books – yet still being edited! Times of Oman refused to publish anything about my books because mainly who I am – but the excuse ‘was because you write for Observer – our competition’! Surprisingly Muscat Daily was more professional in looking at the overall interests – and thinking outside the box! Today my columns were also being killed from the inside by new people and ideas (sic!) from some of them! It is a sad day in Oman today when voices speaking out are being curtailed and killed this way – just because of subjectiveness, inward thinking and polarisation – and all the good works done by HM who himself personally talked about Road Safety – and his speech reproduced in my two books. When such accidents happen now and in the future – please be kind enough to hold your head down in shame and guilt – because the Nation is given lower priority to people being biased and subjective and Polarised! I take off my cap off to MD despite previous differences – anyway. Shame on all of us! Shame! My First Columns articles! Please note the dates! Yesterday my website got over 1000 hits on this same article in absence of news which came next day! See the article by Saleh Shaibany – it is also in my book! Previous School Bus Accident! Why I Quit Writing Now! « Being The Safe Driver! Behind The Wheel!